Lovely colors – just in time for fall. Who knew mandarin ducks mate for life? That is amazing. Anyway, the pillow is gorgeous, dah-ling! How lovely. Seahorses are the same, I believe. Thank you, dah-ling! Hurrah! 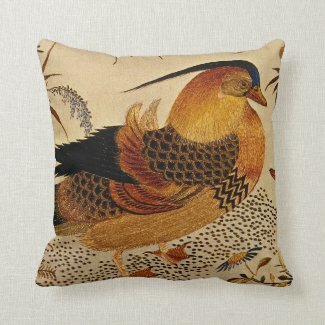 Another sale, and I can see why, as the cushion is delightful. What a gorgeous design. I love the colours. « First Night Design | The Smart Gardener’s Handbook #Sold!